Over the winter break, I went home to Washington state for a week, to spend Christmas with my family. School started up again on Tuesday, the 8th, leaving almost a week in between. I’ve been wanting to go to Thailand while I’m in the hemisphere, and so I did. Unfortunately, plane tickets were already gone when I tried to make arrangements around the end of October. I eventually found a travel agency that had tickets in reserve, but the earliest available flight departed on Friday, the 4th. I figured that it could be my only chance though, so I bought the expensive tickets and made a visit of one evening and two days. 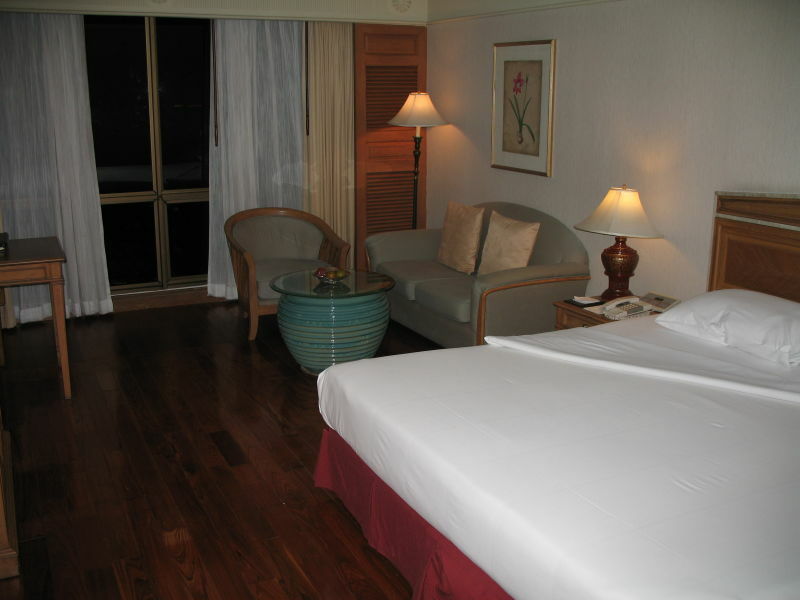 I stayed in a pretty nice hotel, the Imperial Queen’s Park, in Bangkok. Not a full-on luxury hotel, but quite high-end. The location was convenient, the price through the travel agency wasn’t bad, and they had late checkout, which was why I chose them (so I had my room until leaving for the airport at 7pm, Sunday). After staying in Japanese hotels, my room felt huge. Anyhow, I arrived on Friday evening, had an overpriced-but-good hotel dinner, and went to bed early. Thailand is two hours behind Japan, so my 7pm dinner was at 9pm as far as my internal clock was concerned, and I wanted to get an early start the next day. I spent most of Saturday in Ayutthaya. 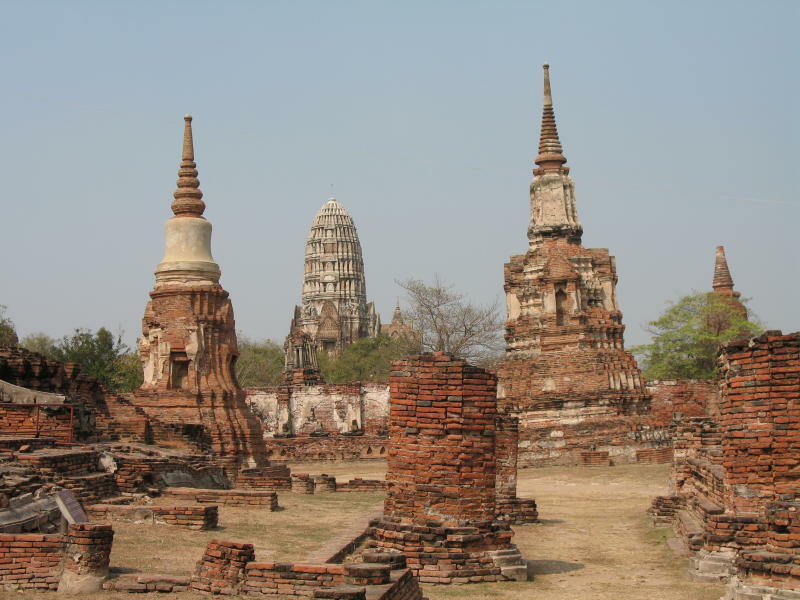 Now just a mid-sized town, Ayutthaya was the capital of the kingdom of the same name from 1350 until 1767, when Burma sacked the city. The army looted the temples and then smashed and burned everything that they could, making a particular point of hacking apart statues of Buddha. Time and nature have transformed this specific bit of desecration into one of the city’s most famous images. Throughout the modern town, ruined temples remain in scattered pockets. The bell shaped buildings with pointed tops are chedis, which are the same thing as stupas in India and pagodas in East Asia: towers with Buddhist reliquaries buried underneath them. The rounded tower is called a prang, and is of Khmer origin. 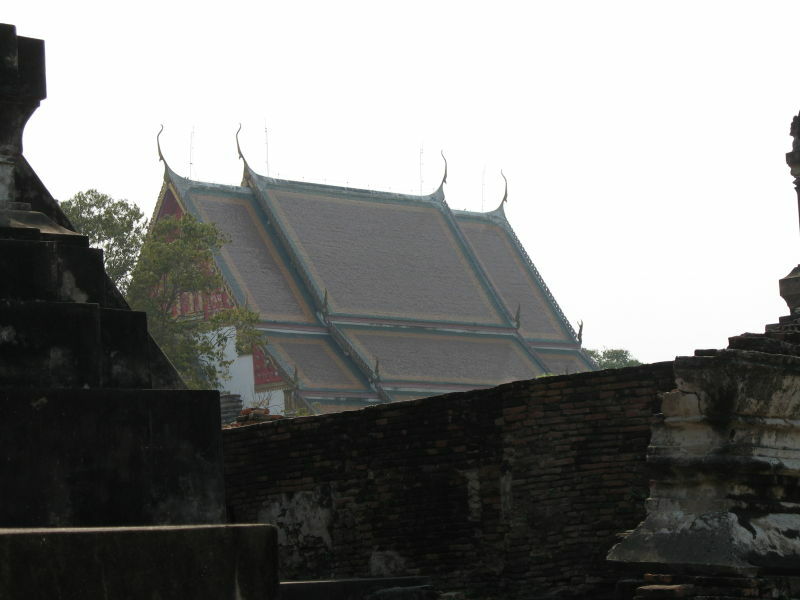 I’m not sure, but I think that Thai prangs are stupas, while the original Khmer prangs were simply temple towers. This restored chedi gives some idea of what the others used to look like. 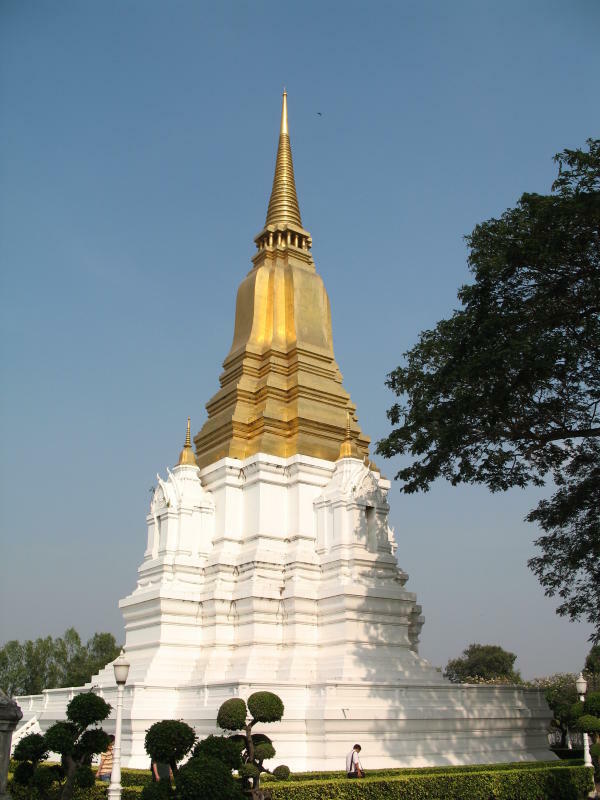 It was built to honor Queen Suriyothai, who in 1548 secretly dressed as a warrior to follow her husband into battle and died taking a blow meant for him. Another restored and functioning building is Viharn Phra Mongkonbophit. This worship hall was built about 400 years ago and has been rebuilt several times. It houses a large statue of Buddha. I’ve got to say, while I really like the buildings in Thai temples, the statues of Buddha that I saw all struck me as, well, not as good as what I’ve seen in Japan. The carving (and/or casting) always seemed a bit plastic and unnatural. The differences in representation were fascinating, though. 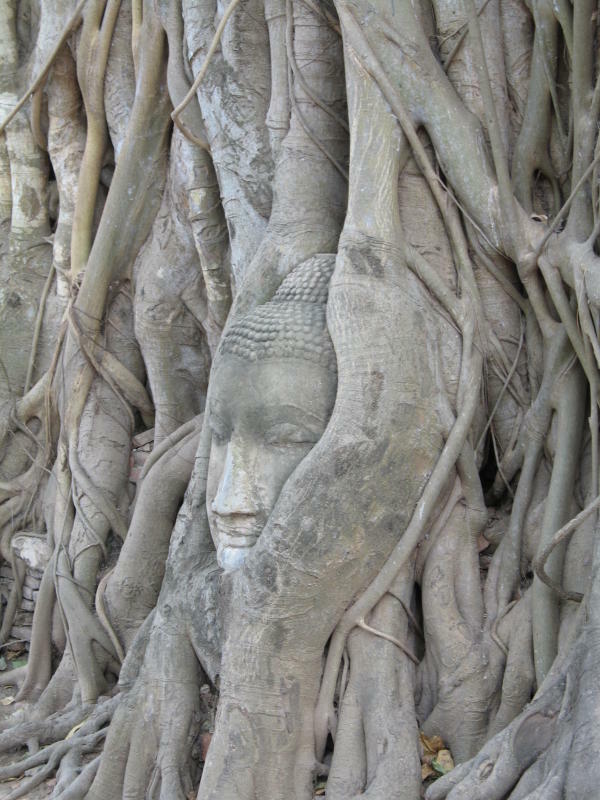 Thai Buddhas are slender and (of course) their features haven’t been Sinicized. And they seemed to always be smiling. Whereas Buddhas and bodhisattvas in Japan usually exude serenity and wisdom, the Thai Buddhas that I saw expressed happiness and contentment. 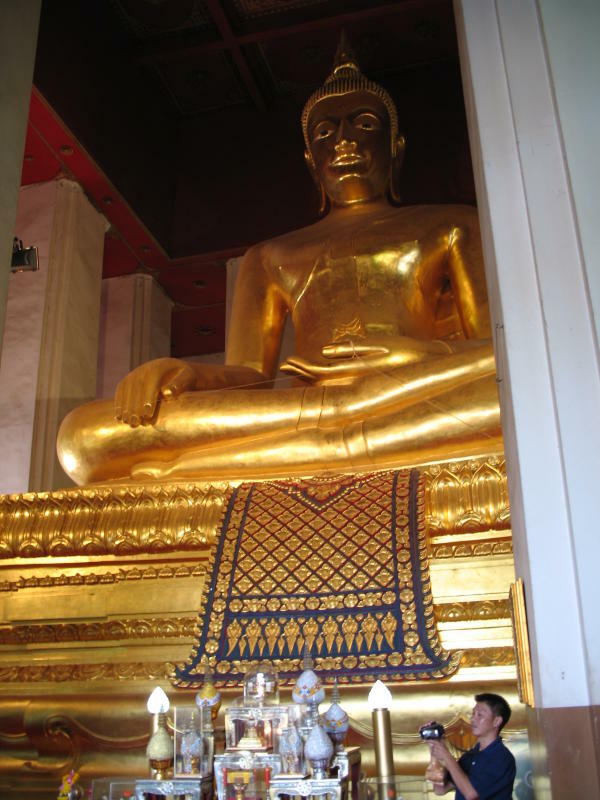 I could go on about Thai Buddhism versus Japanese varieties, but I want to get this post up, so that and the Bangkok half of my trip will have to wait until my next entry. Until then. The side of Japan’s main island that faces the Sea of Japan is less populated than the side that faces the Pacific Ocean, and it’s rather off the beaten path. I’ve only made two trips over the mountains to the other side. One was to Matsue, a couple weeks ago, and the other was to Kanazawa, at the end of August (image from http://www.japan-guide.com). 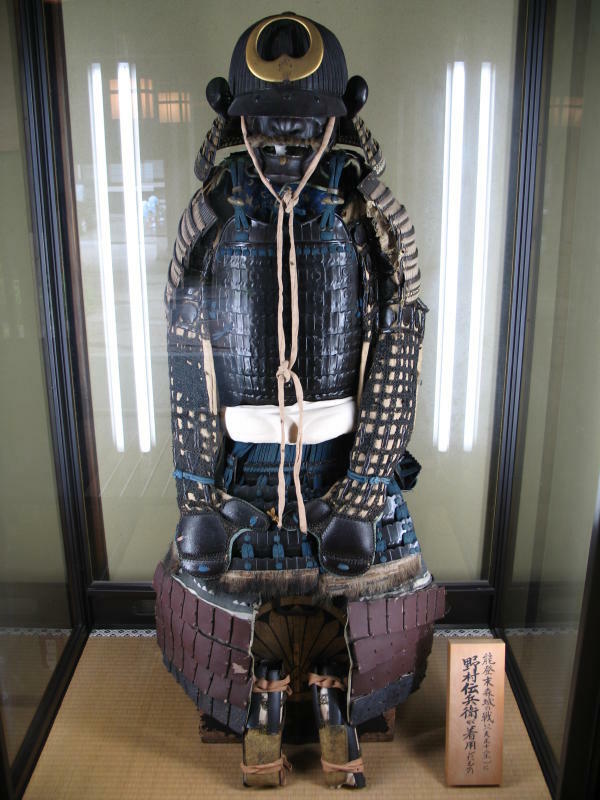 The city of Kanazawa has an unusual history. During the warring states period, a group of monks and peasants ousted the lord of the area and established a “Peasant’s Kingdom.” They successfully ruled themselves for about one hundred years, from the late 15th century to the late 16th century, until Japan’s reunification under the Tokugawa Shogunate. 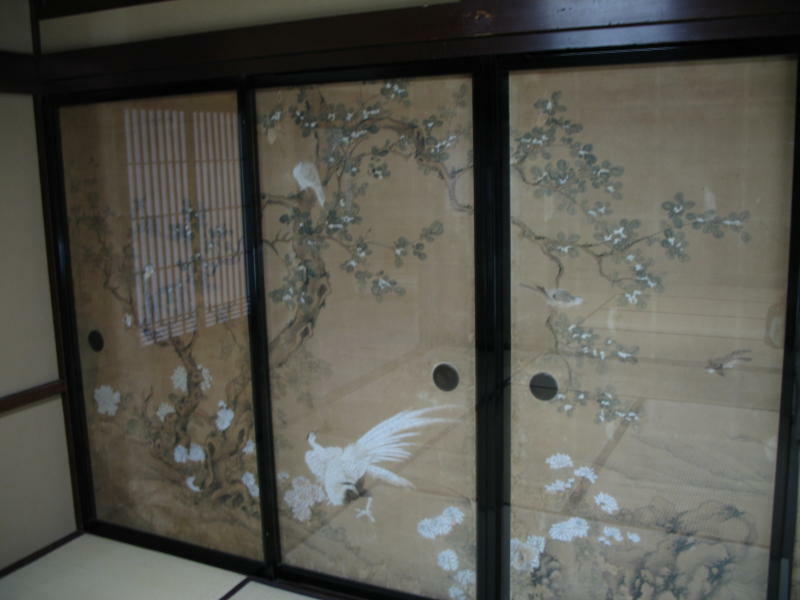 Under the new lord sent by the shogun, Kanazawa, already wealthy from its considerable agricultural output, became a major producer of gold leaf, and it developed into an important center of art and craftsmanship. Around the end of the 17th century, the shogunate made gold leaf a government monopoly, and its manufacture was restricted to Edo (which became Tokyo). 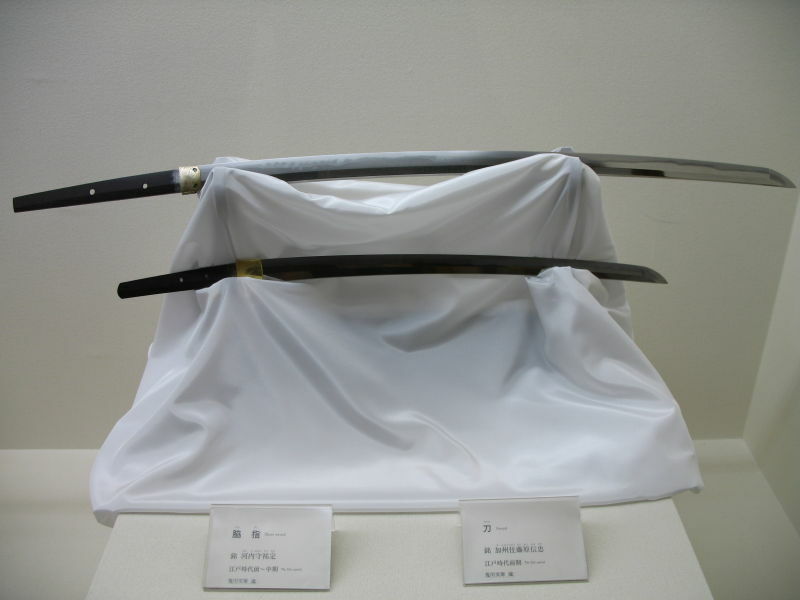 Kanazawa however, continued to make gold leaf in secret, and after the Meiji Restoration it resumed open production. Kanazawa craftsmen created the first mechanized gold leaf press/hammer and today, Kanazawa accounts for more than 95% of Japan’s gold leaf production. One symbol of Kanazawa’s wealth and culture is Kenroku-en, an expansive garden adjacent to Kanazawa Castle. Kenroku-en was originally the lord’s garden, but it was opened to the public in 1874. This long-legged lantern is the garden’s most iconic feature. Not many flowers were blooming in late August, but the garden was filled with wild birds. 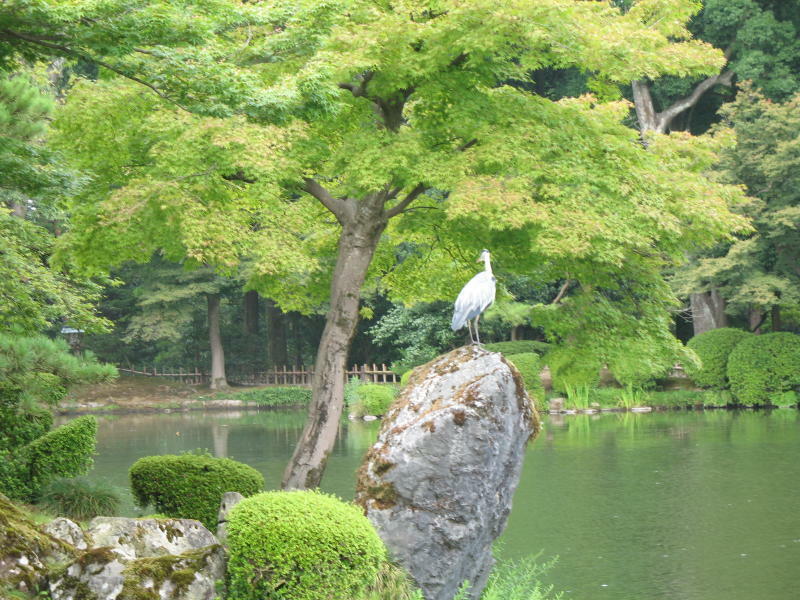 Appropriately enough, the heron – a symbol of longevity – was resting on an island meant to represent the legendary Horai, the island of immortals. In addition to the garden, the highlights of my visit were Seison-kaku and the former Nomura residence. Seison-kaku was the villa of the lord’s wife. It’s gorgeous and has some fascinating European touches, like stained glass from Holland and some rooms with vividly painted walls. No pictures allowed, but you can see a little at the website. 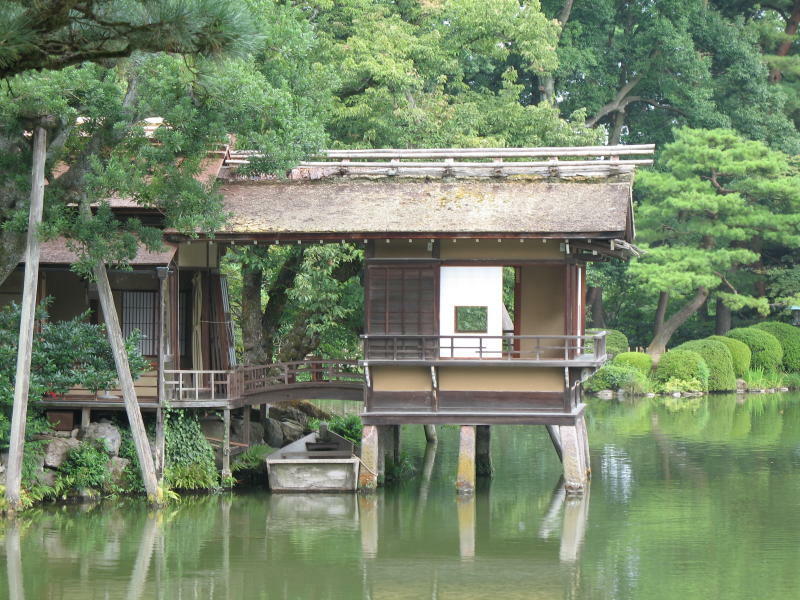 Moving down the ladder of social hierarchy, the Nomuras were the lords’ chief retainers, and their old residence is a beautiful example of a high-ranking samurai’s house. It’s not mansion-sized, but the building is handsome, the garden is very good, and every sliding door is a work of art employing Kanazawa gold. This is a typical room. 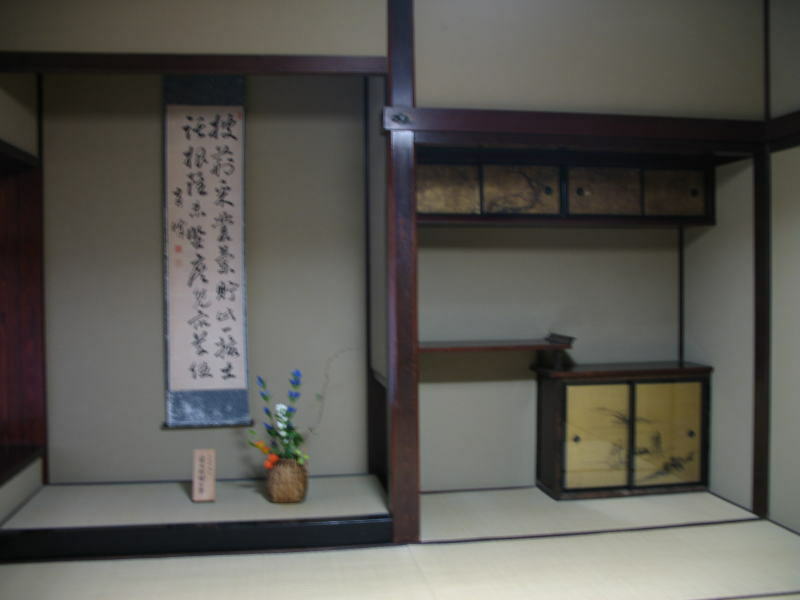 Tatami matting, bare walls, and an alcove displaying calligraphy and flowers. The aforementioned doors had protective covers, making it hard to take pictures without glare and reflections, but this shot isn’t too bad. A suit of armor was on display in the entryway. Additional treasures were shown in a small, single-room museum attached to the house (in the place of an old storehouse, I think). 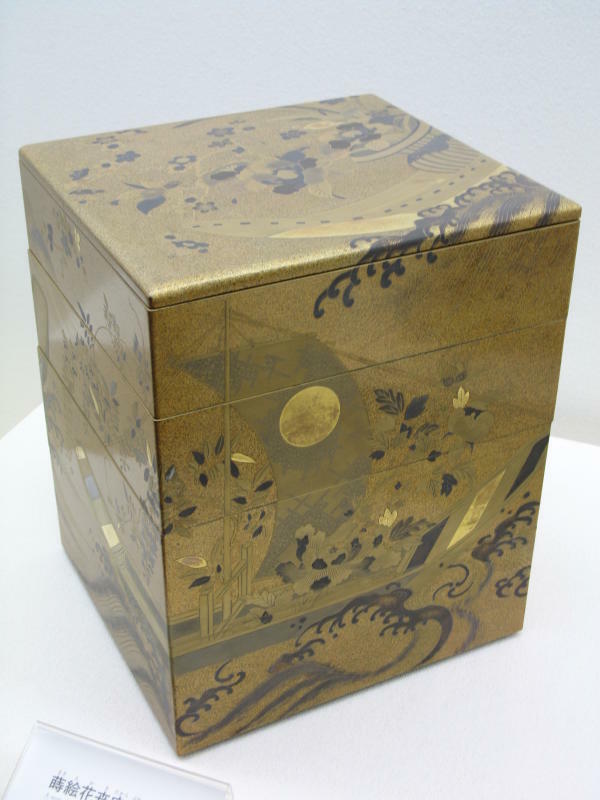 Things like these swords . . .
. . . and this lacquered box. 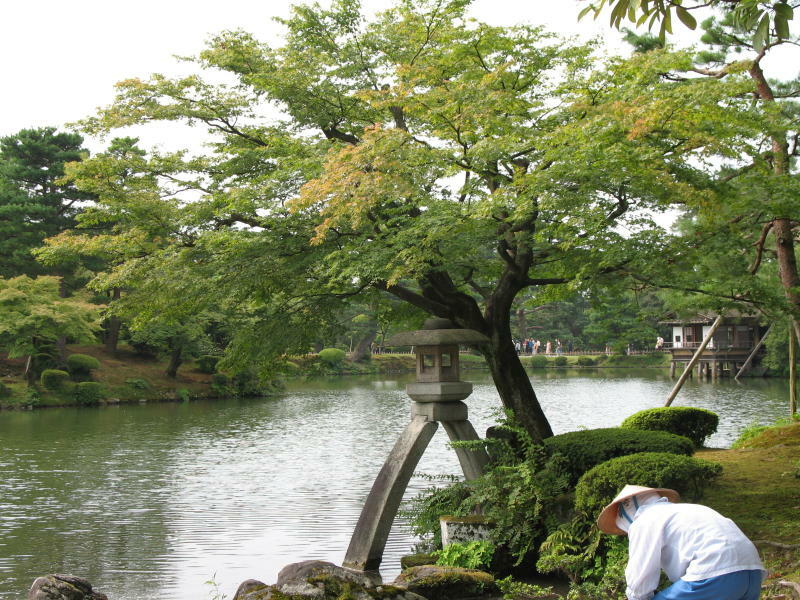 Trees in Japanese gardens are often pruned into bonsai-like shapes, and sometimes they been made to grow too horizontally to support their own weight. Poles are used to keep such trees from breaking or falling over. 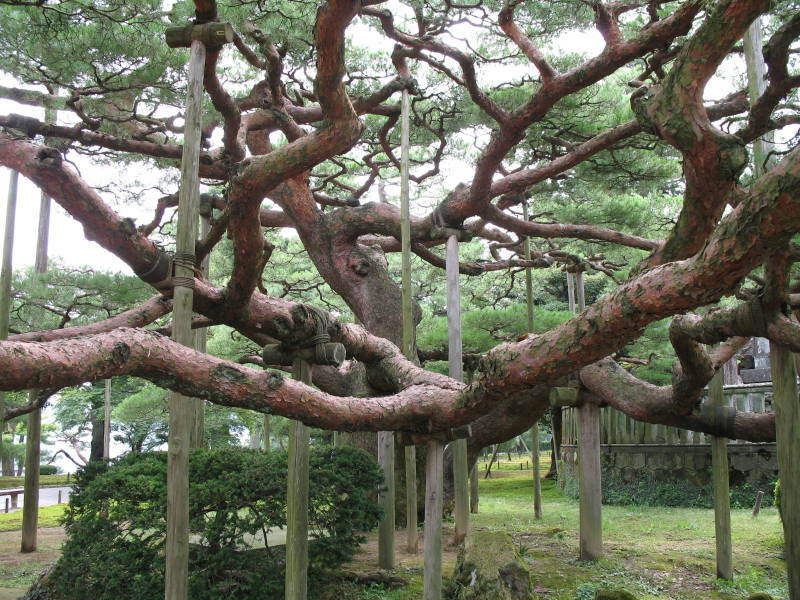 This pine at Kenroku-en is probably the most extreme example I’ve seen. You are currently browsing the Erratic Dispatches blog archives for January, 2008.